The OSU Biodynamics Laboratory uses MSC Software to assess lumbar spine forces with different lift devices during patient handling. An increased risk of low back pain (LBP) among health care workers has been recognized for quite some time1,6,7,10,17,18,35,36,38,42. Specifically, patient handling has been recognized as a high risk activity4,5,7,8,11,12,19,21,35,36,39,41,42. Patient lift devices are considered a potential intervention, however, few biomechanical analyses have investigated the spine loads associated with these devices. The objective of this study was to assess the spine loads occurring when operating ceiling-based and floor-based patient handling devices under typical patient handling conditions. Ten subjects were recruited in the study. The average(SD) age of the subjects was 24.2 years (4.7 years), while height and weight of the subjects were 175.1 cm (12.0 cm) and 70.7 kg (16.1 kg) respectively. The independent variables consisted of the patient handling system, patient weight, and control required to maneuver the course path. The two patient handling systems consisted of a ceiling-based (Likorail 243ES 230 kg capacity; Liko, Inc.™, Franklin, MA, USA) and a floor-based (Viking L 250 kg capacity; Liko™) patient transfer system. The floor-based system was tested using two different wheel configurations(large and small) and under two different floor conditions (hard floor surface and short pile carpet). Patients were represented by anthropometric 'dummies' of different mass, three patient weights were selected consisting of 125 lb(56.8 kg), 160 lb (72.7 kg) and 360 lb (163.6 kg). The path over which the patients were maneuvered was divided into four different sections that varied according to the degree of caregiver control required to operate the system. These sections consist of: 1) straight (no turn section); 2) a sharp (90°) turn section; 3) a gradual turn (as would be expected when turning with no constraints); 4) a sharp (90°)turn within a confined space. The dependent measures consist of the compression, A/P shear and lateral shear forces occurring at the inferior and superior levels of each intervertebral disc between the first sacrum (S1) and the 12th thoracic level (T12). The lumbar motion monitor (LMM), a tri-axial electrogoniometer, was used to measure spine motion and has been previously validated23. An electromyography (EMG) system (Delsys, Boston MA) was used to measure muscle activity of the latissimus dorsi, erector spinae, rectus abdominus, external obliques, and internal oblique muscles. All surface EMGs were collected on both the right and left side. 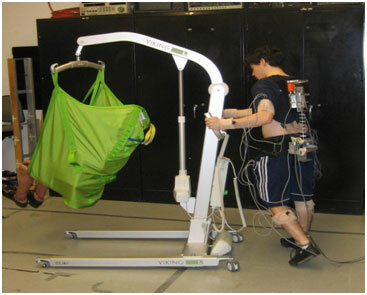 Nine magnetic/gravitational sensors (Xsens Technologies™, Enschede, The Netherlands) were placed on the torso, upper and lower legs, upper arm and pelvis in order to track body posture during the experimental conditions. Figures 1 and 2 show a fully instrumented subject performing the task. The raw EMG signals were processed and then imported, along with the kinematic data, into a subject specific, biologically-assisted (EMG-assisted) model created in the MD ADAMS software (MSC.Software) environment with the LifeMOD (LifeModeler, Inc.) biomechanical plug-in (Figure 3). The model is unique to the individual subject and is calibrated to their specific anthropometry, muscle origins and insertions, as well as their specific EMG activities. While there is no practical way to directly measure spinal forces in vivo, using the ADAMS software to simulate dynamic loads on the body allows our EMG-assisted biomechanical model to estimate the spine forces resulting during the patient handling tasks2,3,13,14,15,16,20,22,23,24,25,26,27,28,29,30,31,32,33,34,40. Ceiling-based patient lift systems provide marked benefits compared to manual patient handling techniques. Floor-based patient handling systems also provide a benefit over manual lifting of patients. In general, they are associated with low levels of spine compression. However, under many of the floor-based system maneuvers observed in this study, A/P shear forces were found to be of a magnitude suffcient to lead to disc damage for the caregiver. These damaging forces occurred at the mid to upper levels of the lumbar spine and became particularly problematic as the caregiver attempted turning maneuvers and especially when turns were made in confined spaces, such as bathrooms. In addition, patient weight had no effect on the spine load of caregivers using ceiling-based lifts, whereas A/P spine shear forces became much greater when attempting to turn floor-based lift systems. Therefore, ceiling-based lifts are preferable to floor-based patient lift systems. If floor-based systems must be used, the floor surface and device wheel conditions must be considered in order to reduce LBP risk exposure. 1) Colombini, et al. 1999. Initial epidemiological data on the clinical effects in health workers employed in the manual lifting of patients in wards. Med Lav, 90(2), 201-228. 2) Davis, K. G., et al. 2002. The impact of mental processing and pacing on spine loading: 2002 Volvo Award in biomechanics. Spine, 27(23), 2645-2653. 3) Davis, K. G., Marras, W. S., and Waters, T. R. 1998. The evaluation of spinal loads during lowering and lifting. Clin Biomech (Bristol, Avon), 13(3), 141-152. 4) de Castro, A. B., Hagan, P., and Nelson, A. 2006. Prioritizing safe patient handling: The American Nurses Association's Handle With Care Campaign. J Nurs Adm, 36(7-8), 363-369. 5) de Looze, M. P., et al. 1998. Muscle strength, task performance and low back load in nurses. Ergonomics, 41(8), 1095-1104. 6) Edlich, R. F., et al. 2005. Devastating injuries in healthcare workers: description of the crisis and legislative solution to the epidemic of back injury from patient lifting. J Long Term Eff Med Implants, 15(2), 225-241. 7) Edlich, R. F., Woodard, C. R. and Haines, M. J. 2001. Disabling back injuries in nursing personnel. J Emerg Nurs, 27(2), 150-155. 8) Evanoff, B., et al. 2003. Reduction in injury rates in nursing personnel through introduction of mechanical lifts in the workplace. Am J Ind Med, 44(5), 451-457. 9) Feng, C. K., Chen, M. L., and Mao, I. F. 2007. Prevalence of and risk factors for different measures of low back pain among female nursing aides in Taiwanese nursing homes. BMC Musculoskelet Disord, 8, 52. 10) Fuortes, L. J., et al. 1994. Epidemiology of back injury in university hospital nurses from review of workers' compensation records and a case-control survey. J Occup Med, 36(9), 1022-1026. 11) Garg, A., and Owen, B. 1992. Reducing back stress to nursing personnel: an ergonomic intervention in a nursing home. Ergonomics, 35(11), 1353-1375. 12) Garg, A., Owen, B. D. and Carlson, B. 1992. An ergonomic evaluation of nursing assistants' job in a nursing home. Ergonomics, 35(9), 979-995. 13) Granata, K. P. and Marras, W. S. 1993. An EMG-assisted model of loads on the lumbar spine during asymmetric trunk extensions. J Biomech, 26(12), 1429-1438. 14) Granata, K. P. and Marras, W. S. 1995a. 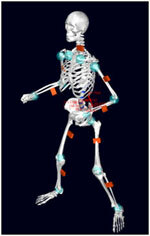 An EMG-assisted model of trunk loading during free-dynamic lifting. J Biomech, 28(11), 1309-1317. 15) Granata, K. P. and Marras, W. S. 1995b. The influence of trunk muscle coactivity on dynamic spinal loads. Spine, 20(8), 913-919. 16) Granata, K. P., Marras, W. S. and Davis, K. G. 1999. Variation in spinal load and trunk dynamics during repeated lifting exertions. Clin Biomech (Bristol, Avon), 14(6), 367-375. 17) Harber, P., et al. 1985. Occupational low-back pain in hospital nurses. J Occup Med, 27(7), 518-524. 18) Hignett, S. 1996. Work-related back pain in nurses. J Adv Nurs, 23(6), 1238-1246. 19) Jang, R., et al. 2007. Biomechanical evaluation of nursing tasks in a hospital setting. Ergonomics, 50(11), 1835-1855. 20) Jorgensen, M. J., et al. 2001. MRI-derived moment-arms of the female and male spine loading muscles. Clin Biomech (Bristol, Avon), 16(3), 182-193. 21) Keir, P. J., and MacDonell, C. W. 2004. Muscle activity during patient transfers: a preliminary study on the influence of lift assists and experience. Ergonomics, 47(3), 296-306. 22) Knapik, G. G., and Marras, W. S. 2008. Spine loading at different lumbar levels during pushing and pulling. Ergonomics, (in press). 23) Marras, W., et al. 1992. Accuracy of a Three Dimensional Lumbar Motion Monitor for Recording Dynamic Trunk Motion Characteristics. International Journal of Industrial Ergonomics, 9(1), 75-87. 24) Marras, W. S., et al. 1999. A comprehensive analysis of low-back disorder risk and spinal loading during the transferring and repositioning of patients using different techniques. Ergonomics, 42(7), 904-926. 25) Marras, W. S., et al. 2002. Spine loads in low back patients during complex lifts. Spine J,4(1) 64-75. 26) Marras, W. S. and Granata, K. P. 1995. A biomechanical assessment and model of axial twisting in the thoracolumbar spine. Spine, 20(13), 1440-1451. 27) Marras, W. S. and Granata, K. P. 1997a. The Development Of An EMG-Assisted Model To Assess Spine Loading During Whole-Body Free-Dynamic Lifting. Journal of Electromyography and Kinesiology, 7(4), 259-268. 28) Marras, W. S. and Granata, K. P. 1997b. Spine loading during trunk lateral bending motions. J Biomech, 30(7), 697-703. 29) Marras, W. S., Granta, K. P. and Davis, K. G. (1999). Variability in spine loading model performance. Clin Biomech (Bristol, Avon), 14(8), 505-514. 30) Marras, W. S., et al. 2001. Female and male trunk geometry: size and prediction of the spine loading trunk muscles derived from MRI. Clin Biomech (Bristol, Avon), 16(1), 38-46. 31) Marras, W. S. and Reilly, C. H. 1988. Networks of internal trunk-loading activities under controlled trunk- motion conditions. Spine, 13(6), 661-667. 32) Marras, W. S. and Sommerich, C. M. 1991a. A three-dimensional motion model of loads on the lumbar spine: I. Model structure. Hum Factors, 33(2), 123-137. 33) Marras, W. S. and Sommerich, C. M. 1991b. A three-dimensional motion model of loads on the lumbar spine: II. Model validation. Hum Factors, 33(2), 139-149. 34) Mirka, G. A. and Marras, W. S. 1993. A stochastic model of trunk muscle coactivation during trunk bending. Spine, 18(11), 1396-1409. 35) Nelson, A. and Baptiste, A. S. 2006. Evidence-based practices for safe patient handling and movement. Orthop Nurs, 25(6), 366-379. 36) Nelson, A., et al. 2008. Myths and facts about safe patient handling in rehabilitation. Rehabil Nurs, 33(1), 10-17. 37) Nelson, A. L., et al. 2007. Safer patient handling. Nurs Manage, 38(3), 26-32; quiz 32-23. NIOSH. 1981. Work Practices Guide for Manual Lifting (No. DHHS (NIOSH) Publication No. 81-122). Cincinnati, OH: U.S. Department of Health and Human Services, Public Health Service, Centers for Disease Control, National Institute for Occupational Safety and Health, Disvision of Miomedical and Behavioral Science. 38) Pheasant, S. and Stubbs, D. 1992. Back pain in nurses: epidemiology and risk assessment. Appl Ergon, 23(4), 226-232. 39) Schibye, B., et al. 2003. Biomechanical analysis of the effect of changing patient-handling technique. Appl Ergon, 34(2), 115-123. 40) Theado, E., Knapik, G. and Marras, W. 2007. 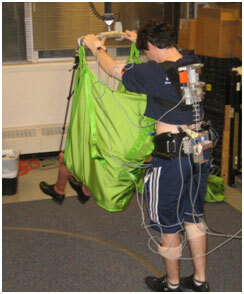 Modification of an EMG-assisted biomechancial model for pushing and pulling. International Journal of Industrial Ergonomics, 37, 825-831. 41) Waters, T. R. 2007. When is it safe to manually lift a patient? Am J Nurs, 107(8), 53-58; quiz 59. 42) Waters, T. R., Nelson, A., and Proctor, C. 2007. Patient handling tasks with high risk for musculoskeletal disorders in critical care. Crit Care Nurs Clin North Am, 19(2), 131-143. Marras, W.S., Knapik, G.G. and S. Ferguson 2009. Lumbar Spine Forces during Manoeuvring of Ceiling-based and Floor-based Patient Transfer Devices. Ergonomics, 52(3), 384-397.